If you are the type of person who heads right to the buffet table as soon as you arrive at a party, here’s what’s on the table. The good folks at Longfield Gardens set up a nice buffet, I mean giveaway, of a Winter Gift Kit, featuring amaryllis or paperwhite bulbs, plus a rare bulb called Scilla madeirensis. Leave a comment below to enter the drawing by 11:59 pm EST on Dec. 10th. One person will chosen on Dec. 11th to win both prizes. To enter the drawing a second time, tweet a link to this post, and then comment again telling us your Twitter name. Want to enter a third time? Just post a link to this contest on your Facebook page and leave a third comment here to let me know you did that. That's three trips to the buffet table, I mean three chances to win. But if that isn't enough entries, you can enter a fourth time by subscribing to Longfield Gardens email newsletter and then adding a fourth comment below. That’s up to four chances to win. Crazy good chances to win. It's the holidays, after all. And in case you don’t win, and decide you can't live without growing that Scilla or some other bulbs, you can get 20% off your Longfield Gardens order anytime until Dec. 20th by entering "MayDream20" as the discount code. Only one discount per customer, and discount can not be combined with other offers. Contest is for U.S. residents only. There are toys that make noise - whistling, beeping, and clanging. There are lights a-plenty, too - the bright lights of stores and over the top holiday displays. The traffic, oh my, and don’t even get near a shopping mall. It’s enough to fray the nerves, and it does. Slow down, I say, and what better way to do that than to put your hands back in the dirt and grow some indoor bulbs. Nothing could be easier, whether you grow amaryllis or paperwhites or even something a bit more exotic like Scilla. Most indoor forced bulbs grow fairly quickly, too, yet slowly enough to force you to slow down a bit, to wait awhile, until one day, there’s a bloom. And isn’t it a good thing to slow down a bit during the holidays, to be forced to wait, and then experience something that doesn’t make noise or have bright lights or tie up traffic? And it calms your nerves, too? I know it's a good thing. I always pot up some amaryllis and paperwhites during the holidays. And I give them as gifts, too. This year, Longfield Gardens provided me with some amaryllis to grow. I potted them up before Thanksgiving and already they are up and soon will be in bloom. 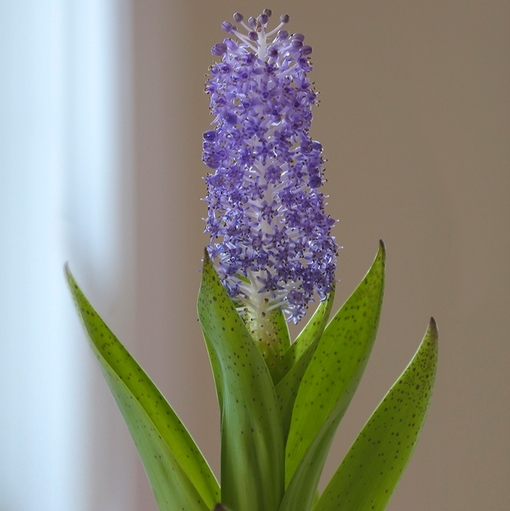 And they sent me a Scilla bulb, too. When it blooms it will look like the one in this picture. It’s magical looking in the pictures, isn't it, with just enough sparkle to make me want to grow it, to see for myself. Compliments of Longfield Gardens, I am giving away some bulbs to one lucky commenter here at May Dreams Gardens. See above on how to enter the drawing up to four times to win your own bit of holiday slow down, also known as a Winter Gift Kit and a rare, exotic Scilla bulb. The contest ends Dec. 10th, so don’t delay. It costs nothing but a few seconds of time to enter by leaving a comment, multiple comments, so go ahead. Do it. Slow yourself down this holiday season with some indoor gardening. Grow some bulbs. Update Dec. 11th. The random number drawn was 9, so our ninth commenter, Gail, is the winner. Thank you all for entering and remember the Code MayDream20 will get you 20% off on the Longfield Gardens website until Dec. 20th! Indoor bulbs in the winter are lovely! I would love to add the bulbs from Longfield Gardens to my current collection of bulbs. oh yes, I rush right to the buffet table, lol. Please consider me a contestant for this lovely giveaway. I don't tweet or FB, so no chances there, durn! ginny dot talbert at gmail dot com. ...and subscribed to Longfield Gardens because that scilla is marvelous looking! Sign me up for the drawing I could use a beauty like this Longfield bulb this winter. I have never grown a bulb indoors before but I have always admired a close friend's. She has a way with plants! That's something I'd like to try! Some winter gardening that doesn't require going out and getting cold! Sounds great! That scilla in bloom is just beautiful! Love Longfield Gardens. Love that scilla and one can never have too many amaryllis! 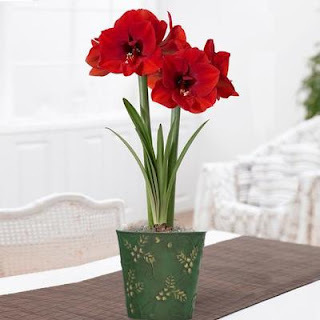 I love indoor bulbs especially amaryllis flowers. I especially like paperwhites but growing anything during the winter months makes me happy! I would love to grow some fresh flowers in our cold, cold Michigan winter! I would love this kit to brighten the winter. I would love to give this to an elderly neighbor who loves to garden. I love amyrilis and paper whites especially during the holidays and winter monthe. It's a great way to bring some life inside. Thanks for the chance to win! Signed up for the Longfield Gardens email newsletter. Thanks! What a fun contest and beautiful plants! Thanks for the introduction to the hyacinth, it was new to me. I love Amaryllis. Having them bloom in the home over the winter helps alleviate the winter blues. It makes me happy to see something blooming in the winter months. Thanks for the chance. Would love to win the bulbs. I love these beautiful bulbs! They would look so great in my house! Look so pretty, I'd love them! I already have my amaryllis but I hope you'll come over and take a chance at my Giveaway - Terrariums: Gardens Under Glass published by Cool Springs Press - and of course - a copy of The Roses at the End of the Road. That scilla is gorgeous! Thanks for the reminder, Carol, to get my amaryllis bulbs out of the garage and planted up now so that I can enjoy them during the coldest days of winter. I am a bulb fanatic! I love forcing bulbs to bloom indoors!! I subscribed to Longfield Gardens newsletter! Flowers are always the best gift ever, especially this time of the year. My mother (age 79) loves amaryllis! This would be so wonderful to win for her. Would love having their bulbs to brighten up the space! They look beautiful. Also signed up for the email list! Yes, please! I would love a chance at winning a kit. Nothing brightens the day like beautiful blooms! Just tweeted a link at @donnacash7! Just shared with friends on Face Book! Subscription to Longfield Gardens E-News done! I think my grandmother would love this. Thanks for the chance to win. Happy Holidays! Thank You for the giveaway… would love a Winter Bulb Kit for my Mom to enjoy during the Holidays ! I absolutely love amaryllis, they have such a beautiful boom. Ooh, these are gorgeous. I would love to win!